When a caller rings your business and you are unavailable to answer, the call will be seamlessly diverted to our SMARTstrat PA’s. At SMARTstrat, we don’t just work for our clients we become them. By the time we’re making calls for you, we’ll be invisible. Missing important inbound calls? Missed calls directly impact your business. SMARTstrat PAs answer calls for busy companies and individuals that understand the value of being responsive and the importance of that first touch point. Whether it’s a new or existing customer, an unanswered call causes frustration and breaks down trust. Is it really? This voicemail message only causes exasperation when your services or attention are needed. 85% of customers don’t call back when their call is unanswered. Could you sustain that level of lost business? SMARTstrat’s call handling clients know that simply answering a call can set them apart from their competitors because our PAs are often told by callers that they have tried other numbers and failed to get an answer. We offer a seamless extension of your business; callers will never know they are speaking to a third party. We also manage telemarketing campaigns to obtain good quality leads for clients which include research and writing scripts. Take a look at our services in more detail and get in touch if you would like a no-obligation quote. One thing is for sure, we will answer your call because it really IS important to us! When a caller rings your business and you are unavailable to answer, the call will be seamlessly diverted to our SMARTstrat PAs. We make calls on behalf of our clients to obtain qualified leads. The telemarketing service includes research and script writing. Our skilled sales team can manage all your inbound sales enquiries and orders. You can focus on growing your business through our telemarketing. At SMARTstrat, we use our expertise to conduct effective telemarketing campaigns for you – but we can also show you how to do it yourself. Can't find what you are looking for? Email us to find out more! 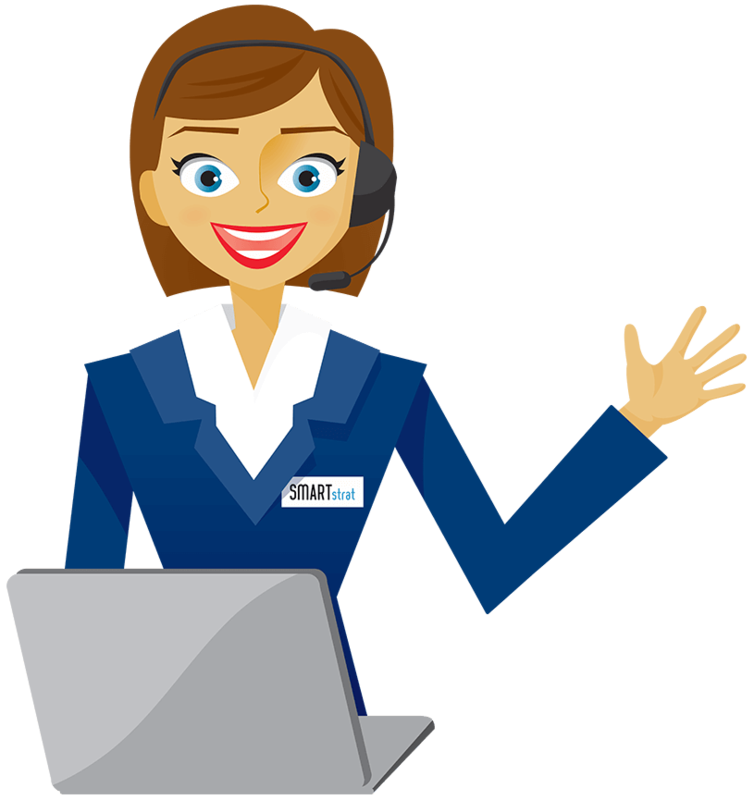 By having the Team at SMART handle both our overflow and out of hours calls we ensure that our customer service levels are maintained and all enquiries from landlords, tenants and new enquires are dealt with swiftly and effectively, they are a vital extension to my team. Nicola and her team at SMARTstrat have been instrumental in helping SCC Developments grow as a business. They turned our vision into a clear strategy and action plan and have worked tirelessly alongside us to ensure that targets were met and goals were achieved. We at Stepping Stones have worked with SMARTstrat on a marketing campaign. Their services are very professional, they say what they are going to do and deliver it! They also kept us up to date at all times throughout our campaign. SMARTstrat ensured that everything ran smoothly and conducted one to one meeting before and after the campaign. We have been delighted with the management of our campaign by SMARTstrat, not only did we get high quality leads which we converted into sales but the time they spent working with us on our campaign set up ensured that vital tweaks were made to our campaign to ensure maximum success. The service provided was excellent, sincere thanks. Nicki and her team handle some very important calls for our business; what impresses me most is that they act as a part of our team in the truest sense, they always ensure that we get the messages, and most importantly, as they did very recently, if there is something really important they make a point of picking the phone up to us and talking us through the call. Having used telemarketing for a long time with mixed results, I invested in a guaranteed appointment campaign with SMARTstrat. The appointments were of excellent standard and resulted in some positive new business opportunities. Handing over my phone calls to Smart has meant I can not only carry out on site jobs efficiently without being disturbed and ensure that my customers always have a friendly, helpful person answering their calls but I also do not miss out on valuable new business opportunities. Being new to the business environment I had no previous experience in sales calls or calls of a professional nature. Nicki came in and taught me the skills of how to be professional on the phone and also how to get through to the people that I really want to speak to. I gained a lot of confidence from working with Nicki which has definitely helped me each day at work.